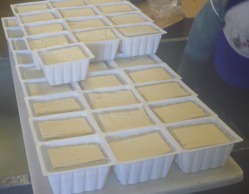 Just before final packaging at Denver Tofu. A few years ago, a news story about the UN Food and Agriculture Organization's "Livestock's Long Shadow" report piqued my interest. It said that worldwide, livestock contributed a 9 percent share in global climate emissions, and an 18 percent share in climate change (including pasture degradation and land-use change). I was already a vegetarian, and glad to know that I wasn't participating in such a detrimental practice. But I longed to know: What was the environmental impact of a meat substitute like tofu? So I visited a conventional soy farm, talked to an organic soy farmer, saw a tofu factory in action and used historical USDA data to figure out the carbon footprint of a pound of tofu. Luckily, a recent Scientific American article, The Greenhouse Hamburger, (Feb. 2009), calculated the footprint of a pound of factory-farmed beef: a whopping 14.8 pounds. Keep that in mind when looking at tofu's footprint. Learn more about the carbon footprint of tofu.